I recently had the opportunity to slip away with some friends to the White Mountains for a day hike. We were going to tackle the Tripyramids, but on a last minute recommendation, we decided to do the Hancock Loop. It turned out to be a great recommendation! 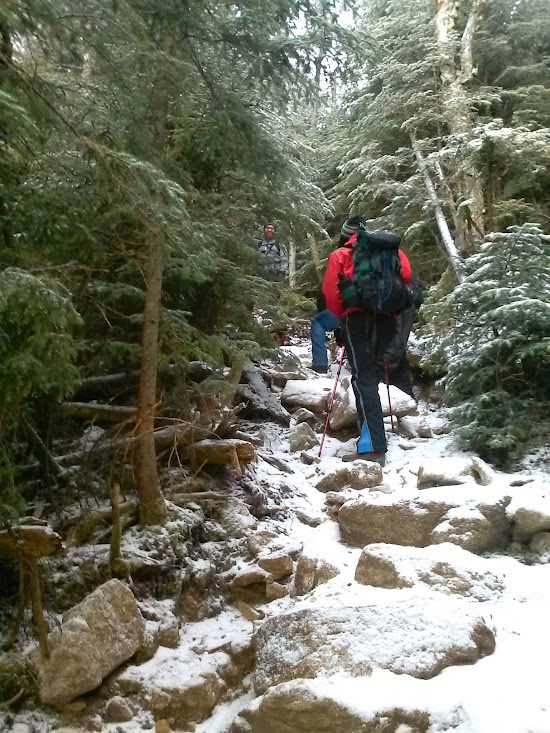 Unlike many hikes to summits of 4,000 footers in New Hampshire’s White Mountains, which involve miles of climbing over rock and root to get to the top, North and South Mt. Hancock are unusual in that they are accessed by a long and beautiful, stream-side walk through the woods, before a short, abrupt climb to the summits and ridge. My friends and I met early Saturday morning in Manchester and headed North on I-93. After a quick stop at Einstein Bagels in Concord, we finished the 2 1/2 hour drive to the Hancock Loop trail head parking, located on the Kancamagus Highway, about 10 miles east of Lincoln. To start, we headed out across the road to the north of the parking area. The trail meanders along the North Fork stream, and we enjoyed hiking in a beautiful forest of conifers. We turned left onto the Cedar Brook Trail after 1.75 miles. This trail winds along and over its namesake and we had to navigate a number of water crossings that we didn’t expect. After about ¾ of a mile, though, we turned left onto the Hancock Loop Trail, which services the North and South peaks. After following the Hancock Loop Trail for about a mile, we made another left to climb the North summit first. From the split to the summit is only .7 miles, but it was the most strenuous portion of the trek. Even though it wasn’t quite as steep of a climb, it reminded me of the climb up South Twin from the AMC Galehead Hut I experienced during my Pemi Wilderness Traverse a couple of years ago. While the trail climbs about 1000 feet in less than a mile, it is a beautiful trek. 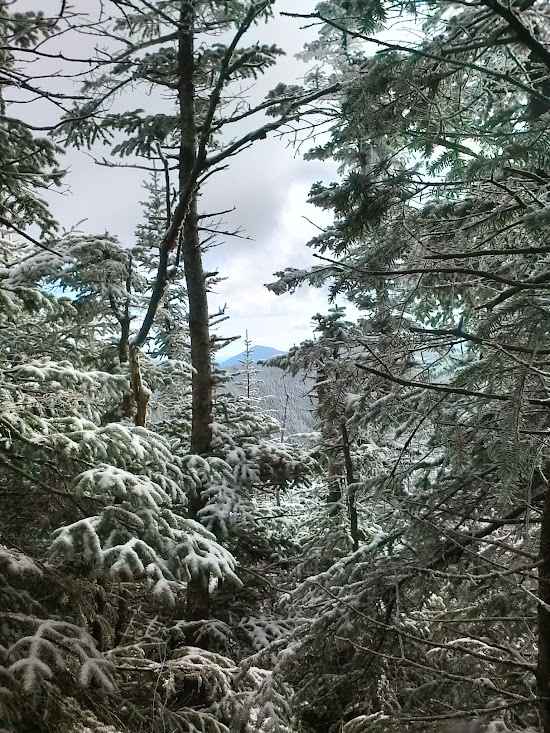 As you climb to the 4,380 ft north summit, views to the south begin opening up. A light snow was dusting the mountain that morning and by the time we reached the climb, the atmosphere of everything felt very surreal. If you can picture standing in the White Witch’s Narnia, that’s what it was like. Since neither North or South Hancock are exposed, we made sure to take a left after our climb to go and visit the north overlook. The sweeping vistas were awe-inspiring, as sun rays poked holes in the cloud cover and radiated off the snow-covered trees and hills (see photo at top of post). This overlook high lighted two things for me. One, that it was much colder than I had realized will trekking and two, the fact that the entirety of the trail was below tree-line made this an excellent cold-weather hike. After enjoying the view, we back-tracked the few steps to the summit and followed the trail to the South summit. The ridge trail was easy walking and the distance to the South Summit only about a mile. Despite being under tree line, it was quite a beautiful experience; winding through an alpine evergreen forest, with ample overlooks and plenty of wildlife. After we finished with the birds, we turned around and headed back to the loop trail and down the south side. The return trip to the car was very easy, though a bit long (at least mentally). This turned out to be a great hike and we had a lot of fun. Because of the water at the lower elevations and the protection offered by the trees at higher elevations, I highly recommend this as a late-Summer through Winter hike. If you’re a Google+ user, you can check out a full photo set from the trip.